This post contains affiliate links. If you click on the links below and make a purchase, I may receive a small compensation to help me finance this site and keep coming up with awesome tutorials and tips! I only ever include links to companies and products that I trust and work with on a regular basis. When Easter time rolled around in my childhood home, it meant pulling out the coffee mugs and tiny squeeze bottles of food coloring to dye our eggs. My sister and I would start off following the recommended “recipes” to get the perfect colors, but we would always end with mixing the dye up and getting a few dark purple or brown eggs by the end. But we always had a ball! Nowadays, Easter egg decorating has gotten much fancier and more creative. The possibilities are absolutely endless! 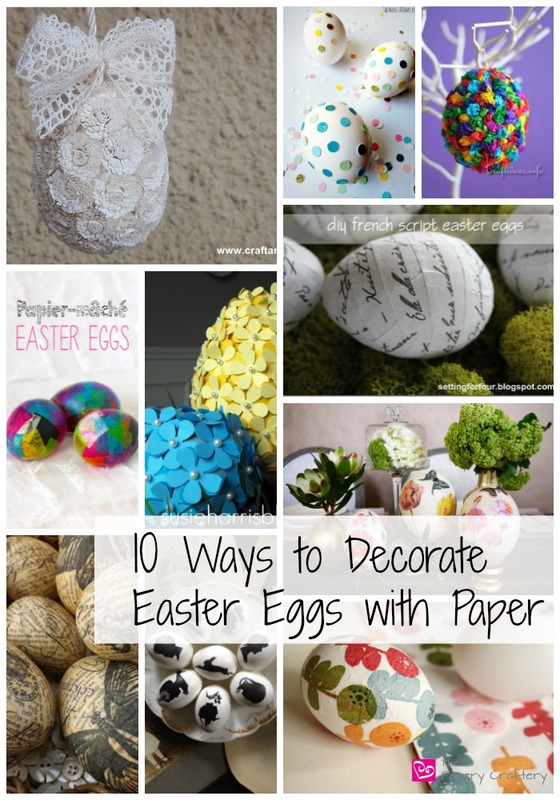 But keeping on the theme of my blog, I rounded up 10 ways to decorate Easter eggs with paper. Whether real, plastic or paper eggs, the results are always lovely! Bright and beautiful tissue paper covered eggs were created by Fireflies and Mudpies. These paper covered eggs by Sew for Soul were made with a similar technique, but with a little more of a classical finish. She Makes a Home has thought of the perfect eggs for those little hands who have recently discovered the amazing tool that is the hole punch! Honestly YUM has taken their decoupage to another level by using carefully cut botanical prints. Bright and lovely, these eggs By Wilma were covered with treasured vintage paper napkins! Paper flowers and pearl pins have turned Susie Harris’s eggs into decor fit for a garden party! Craft Ideas has an Easter egg that even my youngest could master. The Bean is an expert on crumbling paper! These simple and sophisticated French script eggs were designed by Setting for Four. Craft and Fun has created a stunning take on the classic quilling paper egg! Jennuine by Rook No. 17 has instructions on printing silhouettes on tissue paper. Brilliant! My mind is spinning with so many ideas right now! How about printed monograms? Or some decoupaged drawings by my Moose? Kids could even create some portraits of your Easter dinner guests and glue them on your eggs to be used as place cards at your table! UPDATE: I’ve finally been able to create my own quilling paper eggs! Check them out! I wish I had time to create them all! How are you going to decorate your Easter eggs this year? Don’t go without picking up your own paper mache eggs so you can get to work! Thanks Miss J! Paper can do amazing things! Thanks for stopping by, Bobbi! Good idea! We’re expecting tons of snow here tomorrow, so me and my littles will probably be crafting too! Goodness, these are so creative! I especially love the vintage looking ones, I might give those a try this year. I love those ones too, Kate! Wow! So many great ideas…I don’t know where to start! Pinning this for later! So many great ideas. This will be my second year decorating eggs with my daughter, I love the hole punched ones. I think she would too. I think the hole-punched dots are the perfect craft for little hands!